&#x201c;Above the Rocks Suite Lower&#x201d; is a one bedroom, one bath, lower level rental that provides an ocean view. It will comfortably accommodate 3 adults with one double bed and a high end sofa-queen-sleeper with 4" foam/gel mattress, in the living room. Named for the &#x201c;Old Sitka Rocks,&#x201d; which are actually seven small islands that are a magnet for bird life and marine mammals, the area provides wildlife viewing opportunities with Bald Eagles soaring daily. Marine mammals that frequent the rocks area include Humpback Whales, Sea Lions, and Sea Otters. The local commercial fishing boats either pass by or fish the area daily, adding to the relaxing "Sitka" experience. Our &#x201c;Above the Rocks&#x201d; unit is located 1.7 miles from the Ferry Terminal and the spectacular Starrigavan recreation area, including some of the best hiking trails in Sitka. Also less than a mile South is the Halibut Point Recreation Beach, and the Harbor Mountain Road with it&#x2019;s spectacular views and trails. Downtown is 7 minutes away, and the city bus stop is just at the bottom of the hill for those preferring not to rent a car. Large yard with camp-fire pit and benches. 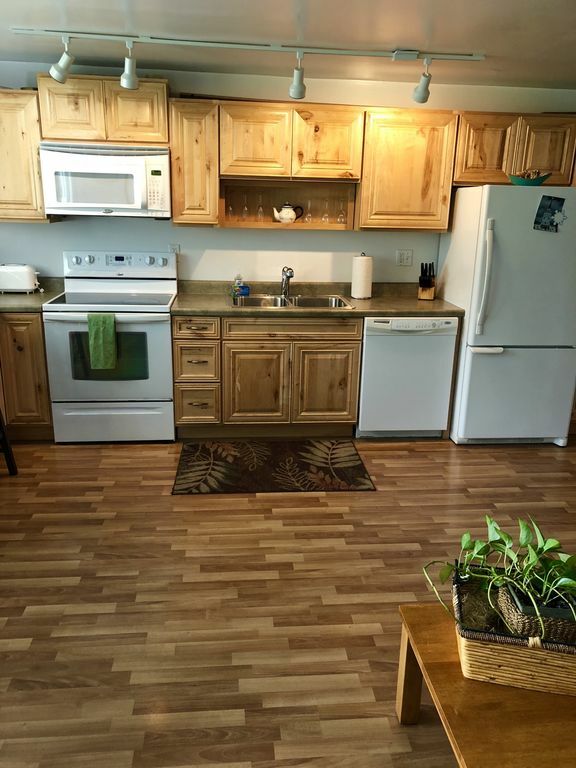 Fridge/Freezer, Dishwasher, Glass-Top Stove, Microwave, Washer/Dryer, and fully equipped kitchen. Cable TV and High-Speed Wireless Internet. Barbecue available for those fresh caught salmon and halibut. Bob was a great host! The apartment is very nice, clean, cozy and comfortable. We had everything we needed, highly recommend. Fantastic stay, great spot with nice touches. A little far out of town but if you've got wheels it's the spot to be.